Yes, I do take commissions. Infantry is $10 a model, regardless of size, up to 40mm round base. Large Infantry and Cavalry is $20 a model, up to 50mm round base. 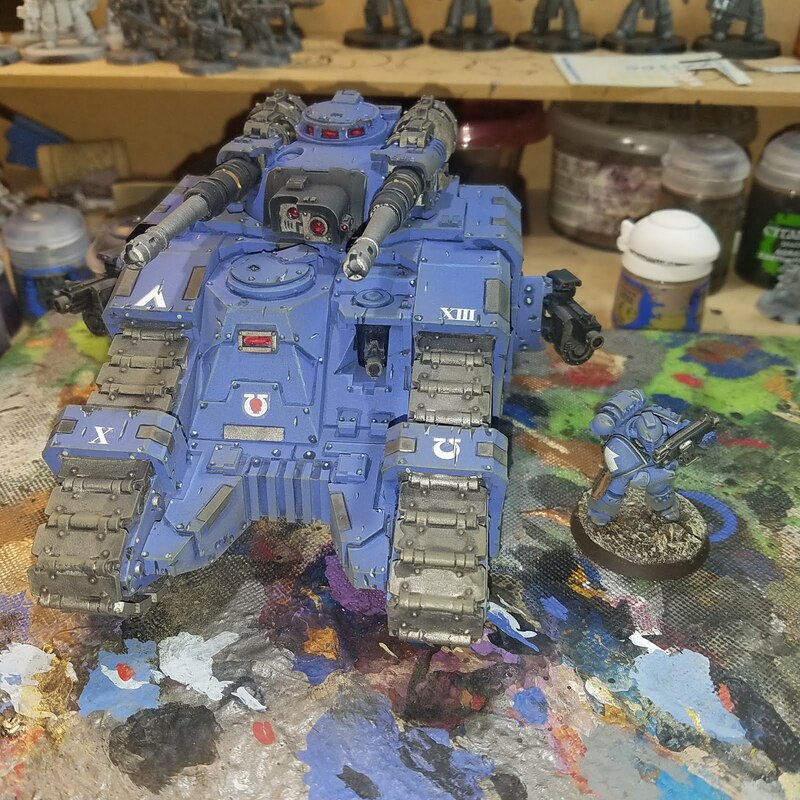 $300 for 40k Land Raider, larger fliers (Storm Raven). These prices include all assembly and basing. If you already have models assembled, primed, or want to do the basing yourself, please contact me and we can talk about reducing the price. 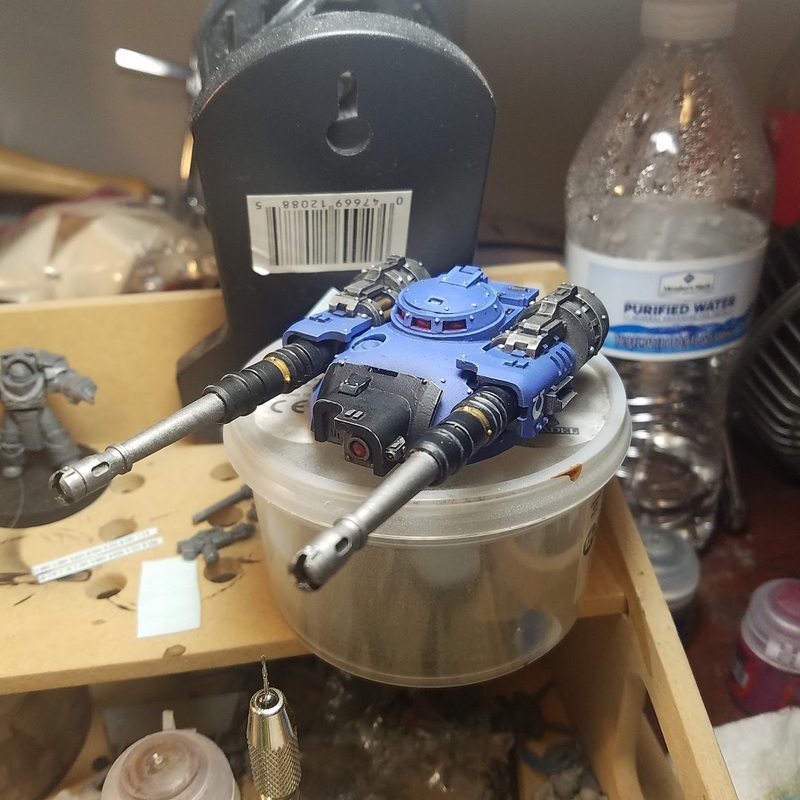 What you get for your money - models will be cleaned of any mold lines and flash, assembled, primed, painted, based, and matte varnished for protection. Will always be beyond the 3 color minimum for tournaments, and will include the little details that we all want. I will paint an army for you that I would be proud to play with myself. I will do custom color schemes, as well as traditional "from the book" schemes. I only have one level, and that is fully painted. 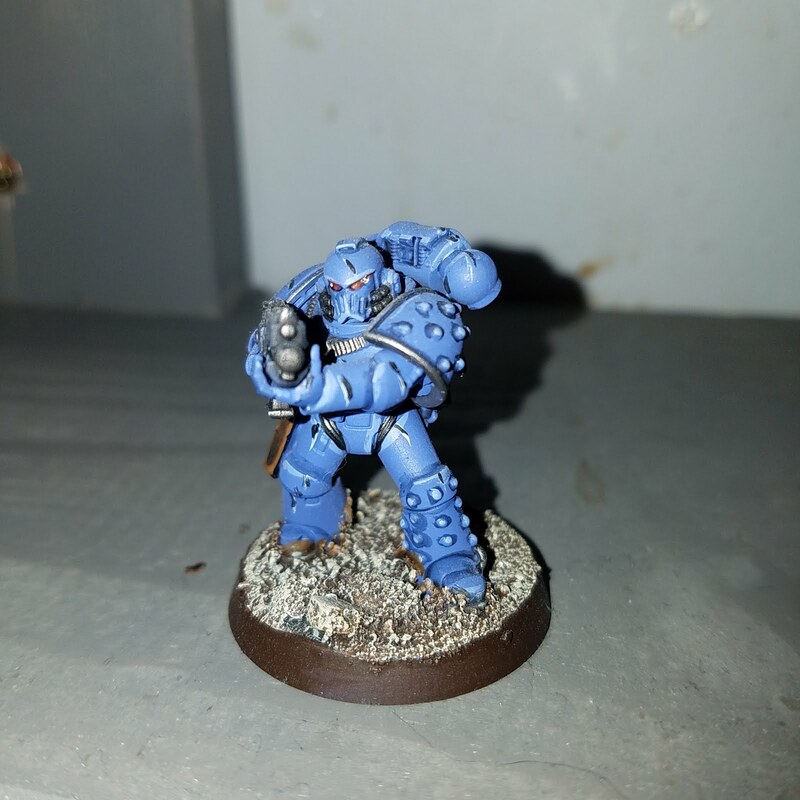 I paint models and have been doing it since I was 12. Over the years I have learned tons of tricks and painted loads of models. I have ran a very successful Miniatures studio, and owned a Retail Game Store. After closing those, I decided to get a little smaller with the operation and I am back to a one man show. Let's make it dirty! - Simple application of weathering powder. 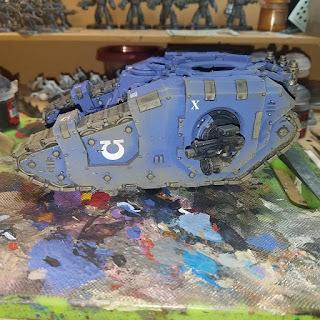 Okay, the last thing to do on the Sicaran is to make it dirty. 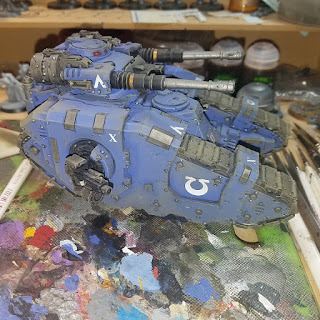 The first 15 legion tactical squad I have done is paint chipped and then weathered using Tamiya Weathering Master Tamiya 87079 Weathering Master A Set - Sand, Light Sand, Mud. 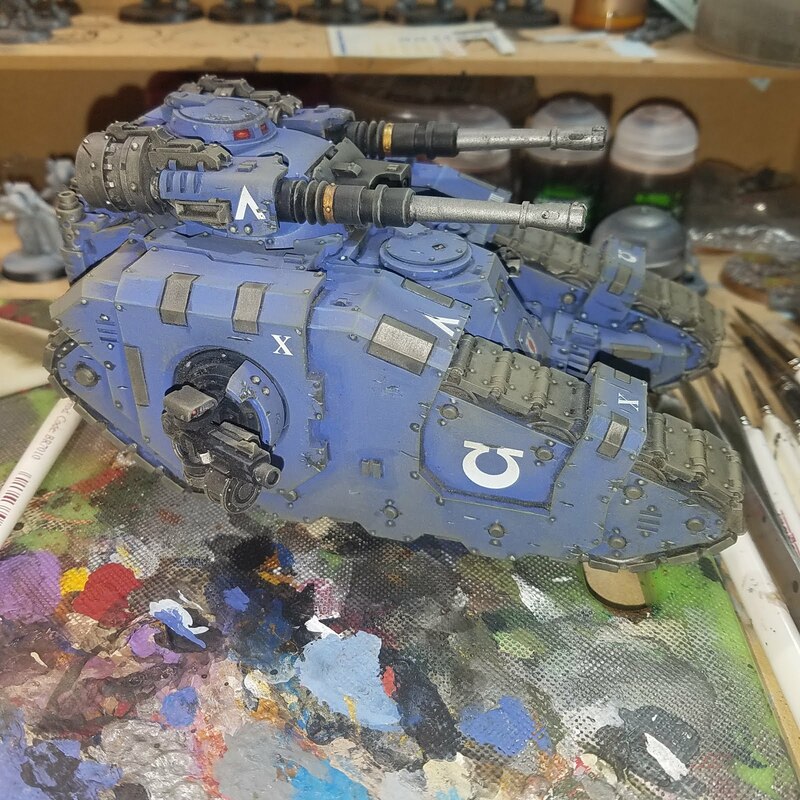 I used the mud color, just like my infantry. Okay, so the first step, is of course, to make sure your model is ready to VARNISH. Yep, that is right. In order to get the weathering powders to stick, you have to matte varnish the model first. I run Vallejo Color Satin Varnish Premium RC Colors through my airbrush. I ran this through and then cleaned out the airbrush thoroughly. 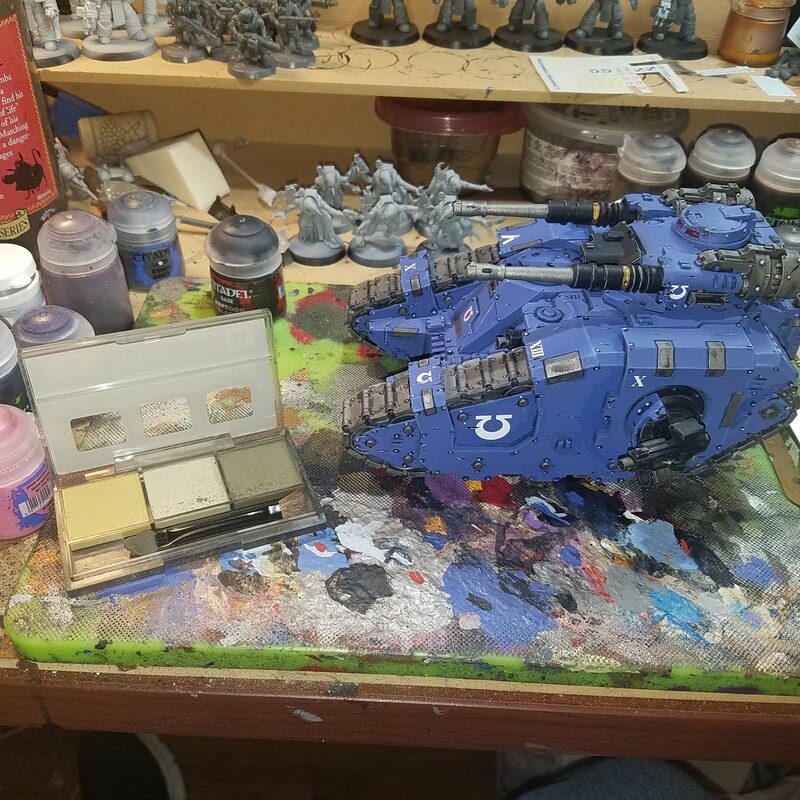 Once the model is dry, grab your supplies. The Weathering Master kit comes with an applicator that is the same as used for eye shadow. I destroyed this weathering up infantry. So I went to Wal-Mart and grabbed up some makeup wedges. Cheap and will work for what I need them for. 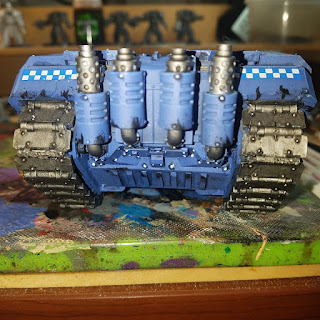 You will also need some rubbing alcohol as a set agent, and then grab up a CLEAN large or medium drybrush. Take the wedge and load it up with powder. Remember the adage less is more. And remember how the tracks move, as you will want to weather that heavier than other areas. 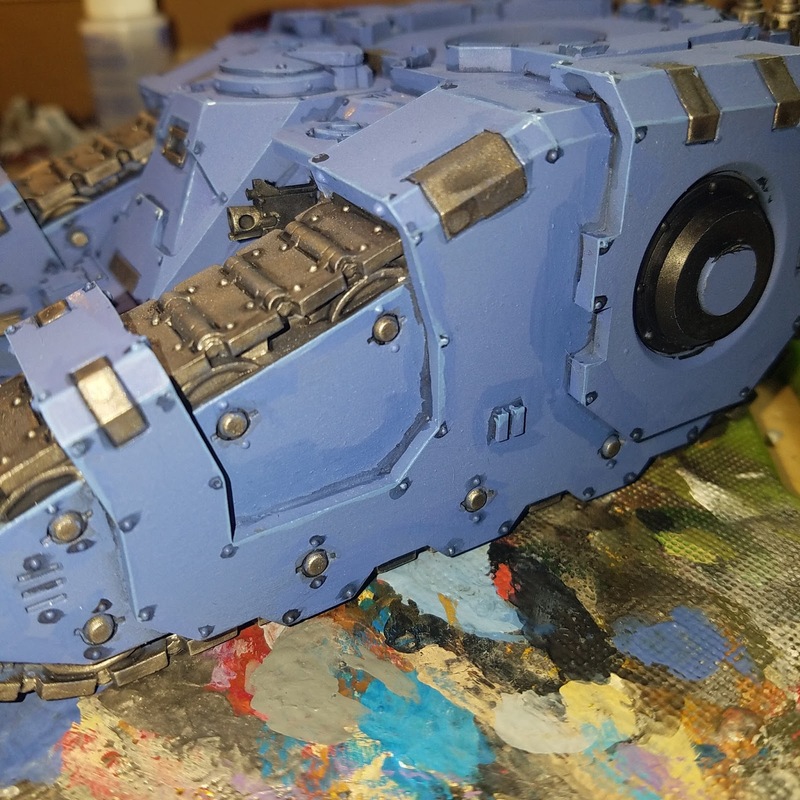 I focused on the tracks first, and the armor plates around the tracks. 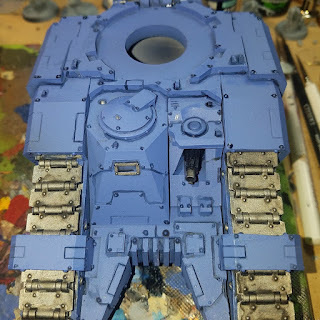 I then applied a light dusting of powder all of the top of the tank. All of the bottom parts, like going under the front hull, up the rear under the engines, I went heavy on the powder. Once the majority of the powder is applied in the heavy areas, I worked it into the smaller cracks using the drybrush. I repeated this a couple of time, all over, until I was happy with the coverage. I loaded the airbrush up with alcohol, turned the air down to 10psi, and shot the whole tank with alcohol. After this was dry, I applied the matte varnish over the model again. The matte varnish reduces the impact of the powder, so if you want it to retain that heavy dirty look, or apply really heavy powder, apply the alcohol right after applying it, using an eye dropper. This works great if you are applying powder mud effects. Once that fully dries, then you can matte varnish again. Okay, go out and make some dirty models! Okay, painting paint chips. There are tons of tutorials online that are great. I really like the one from HandCannon. However, the use of the sponge is a bit fidgety to me. To here is what I do. First, you have to look at what you are chipping. 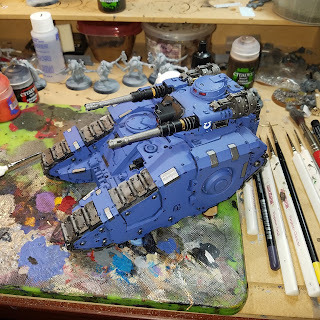 I am working on a Sicaran, so that is what this tutorial is going to cover. Think about how that thing moves. I have seen fantastic looking tanks, weathered up really nice, except the chips didn't make sense around the tracks. I guess an understanding of how tracks works are in order. The red arrows show the direction that the tracks are moving when a tank moves forward. 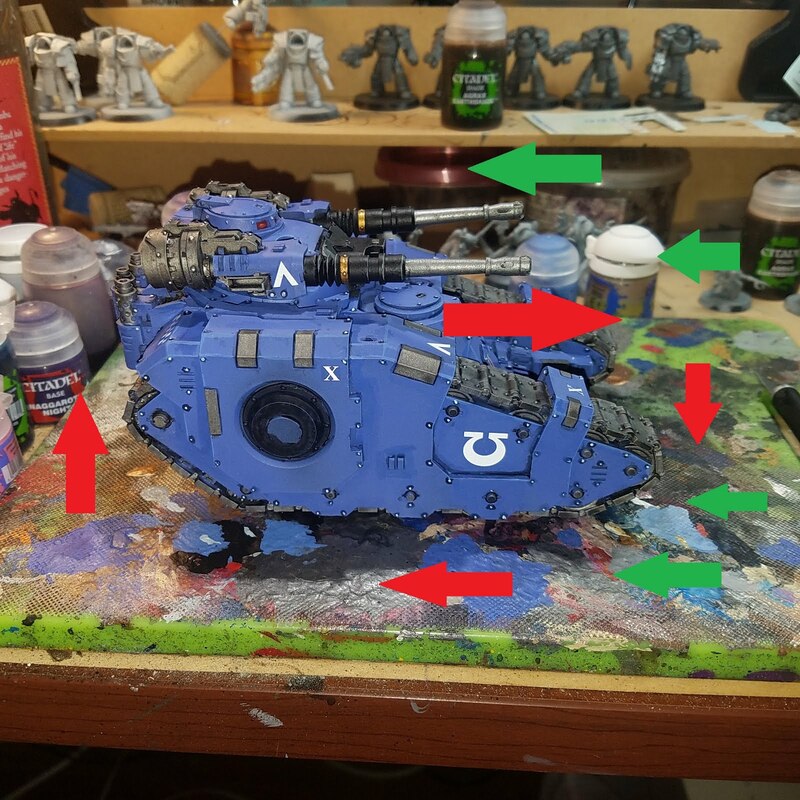 As this is a main battle tank, and the rear armor is normally weaker, most, if not all, of the chipping caused by fighting will be concentrated in the directions that the green arrows are pointing. So, when I add my paint chips, they will be mostly concentrated towards the front, and then on the sides. Okay, remember less is more. I have done this before, so know how much I want to beat up my tank. 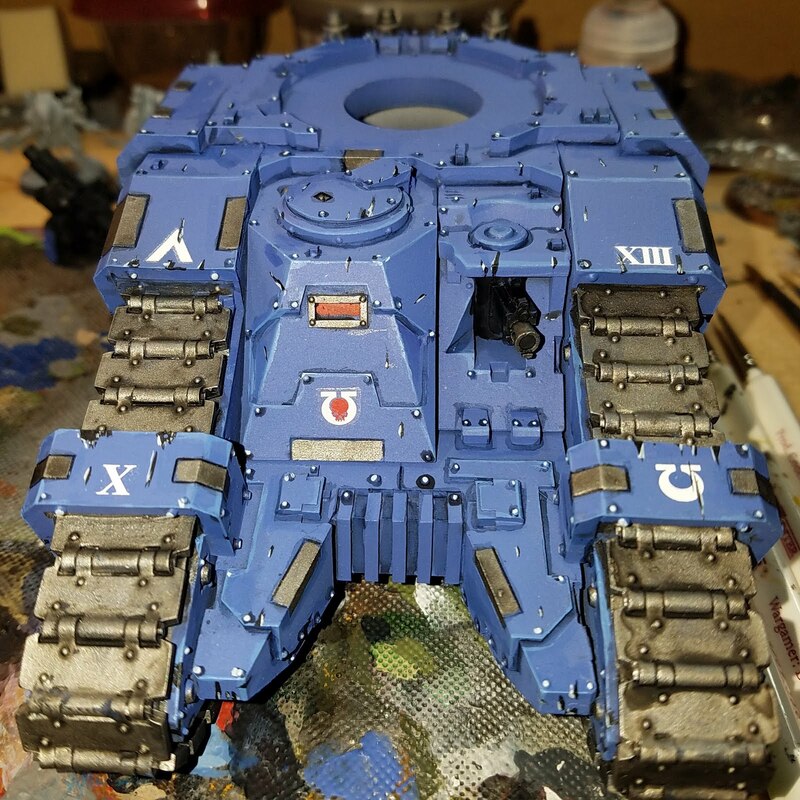 I took regular old black, and painted areas that I wanted to have chipped, keeping in mind track movement and that I wanted more scarring towards the front of the tank. On the back, I also put chips. If you have ever walked behind a track, you know that those things churn the crap out of the ground, pitching up rocks, etc, all over the place. So be sure you don't neglect the back, especially around the track guards, and down low where stuff that was run over may jump up and knock some paint off. 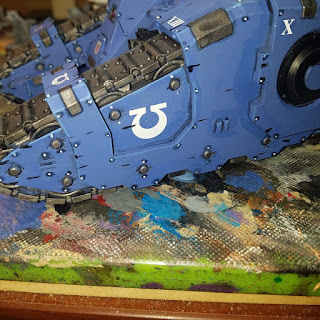 Once you have settled on the amount of chipping you want done, grab your highlight color, and then go one step higher (unless you highlighted with white). Apply a very fine highlight to the BOTTOM of the black marks you applied, and always between the base color and the black. Should end up looking like this. 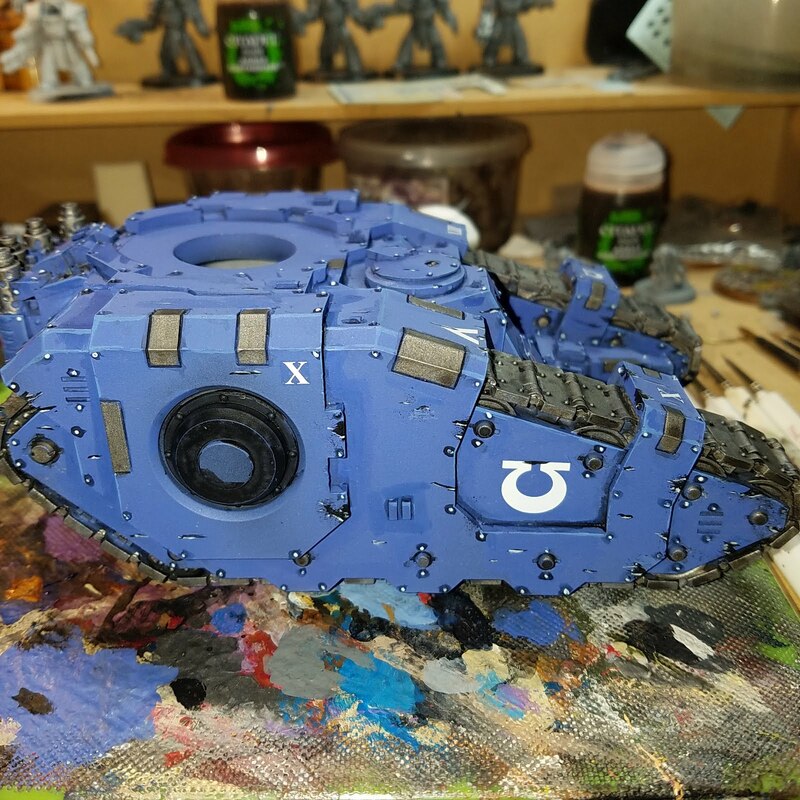 Remember, you can always add more if you are not happy with the saturation of the chipping. Also, keep in mind, when paint chipping infantry, less is ALWAYS more. Highlighting - How and Why? First off, there are as many ways to highlight a model as there are colors in the rainbow. The most important thing to think about (and I will do a tutorial on how I highlight) is to consider WHERE THE LIGHT COMES FROM. 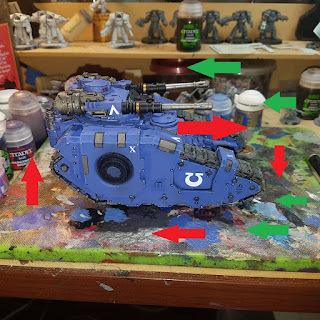 It doesn't matter if you are doing extreme highlights, zenithal, OSL, or any other highlights, you have to make sure that you understand how and where light will hit the model and reflect, and this should be your guide to highlighting. Let's take the Sicaran I am working on. 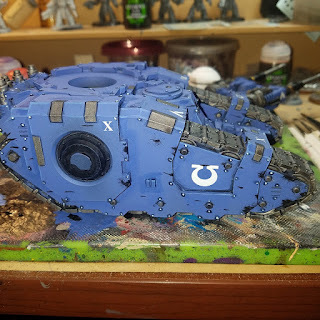 The idea here is to edge highlight the armor plates, using 360 degree top light.I will use line highlights on the larger armor plates, where there are not sharp edges, to pick out details. 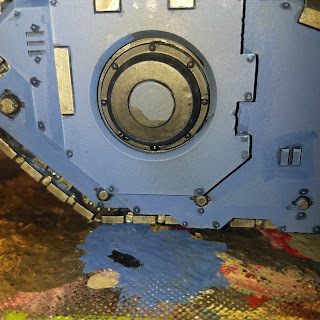 I took my chosen highlight color (1 shade up from the blue, so Calgar Blue), and using a fine detail brush, at a 45 degree angle, using the side of the brush, ran it alonng the edges of the armor plates, resulting in a very fine line. 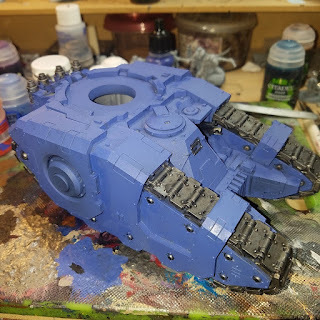 I take my base color, and trim it up, and then the highlighting is done. Of course, I could go a step further, taking an even lighter blue (like PP Frostbite) and applying it to just the highest edges. However, the point is, I have chosen my light source to be at a rough 45 degree angle and all around the tank. The highlights hit all the top edges, but only the vertical edges on the sides. If the edge is pointed downward, no highlight. 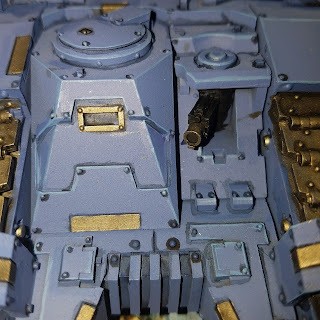 On this part, you can see the highlights across the less sharp edges in the armor plates. Wow - I went and did tons of posts and then things in life got hectic again. Okay, so I made a trip back to AZ in January to watch my best friend get married to an absolutely gorgeous woman (both in looks and soul). This trip was also about me getting to play some games, so I took an army with me. Whilst on a break from playing games, I was talking to a couple of guys about painting and mentioned the term pin washing. Okay, first things, people that know me know I have a tendency to be a speed painter. Depending on the kind of model will determine if a speed painting is going to be the route to go. Lots of washes, minimum highlighting, dry-brushing, etc. 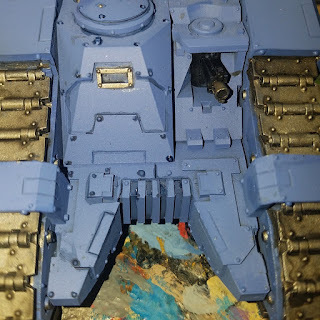 There are 2 different techniques to using washes (and it really doesn't matter what brand you use, most are made up of the same things - a pigment, suspension liquid, and settling agent). The first technique is what I like to call splash and go. Block out your basic colors, wash the whole model, let it dry, pick out some highlights and done! This works really well for natural feel models like Hordes, where you are dealing with lots of big beasts. It also works really well for painting big model count armies, like orks and tyranids. Now the second is pin-washing. This is targeting washing, but only applying it into the very recesses of the area that you are going to shade. 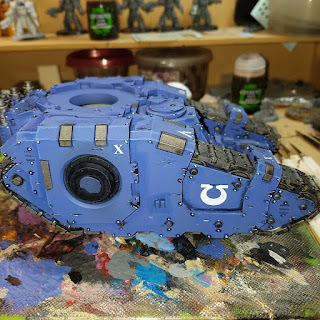 I am going to run through a brief tutorial on how to pin wash. I am a tread head. I LOVE TANKS. However, I hate painting them. However, I do happen to own a few Forge World tanks for the 30k Ultramarines legion. And these are going to get pin-washed as a way to really do the tanks justice. It is VERY TIME CONSUMING. 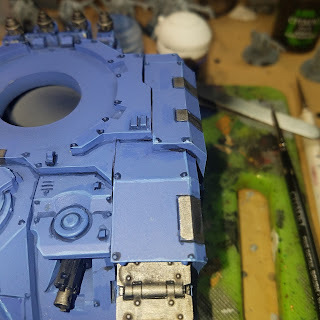 And the rivets.....damn you GW and your rivets. 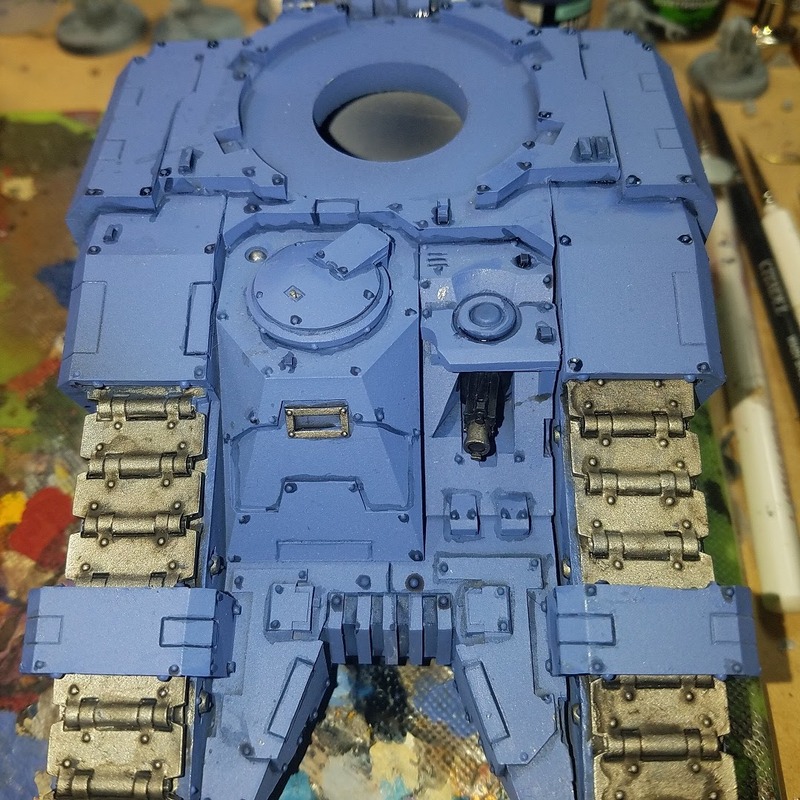 Okay, first step - take your base coat blocked out tank. And messy parts, like tracks, etc, go ahead and knock those out first. On this model, I primed it Ultramarine Blue Surface Primer, and that is the main color of this army. Keep that bottle handy for trimming up later. Second step, select your wash. In my case, I chose Drakenhoff Nightshade, which is a nice DARK blue. Using an artificer detail brush, or a 000, or fine detail brush, using the very tip of the brush, paint the wash into the recesses. Be as careful as you can. On the left, you can see where it got a little squirrely, as those areas are packed in there. On the right, you can see the area after it was sprayed. Really drops some depth in there. I work from the inside out when pin washing vehicles, because as you work on them, it is natural to hold the tank by it's sides. When done, it should look something like this. See what I mean about the rivets? 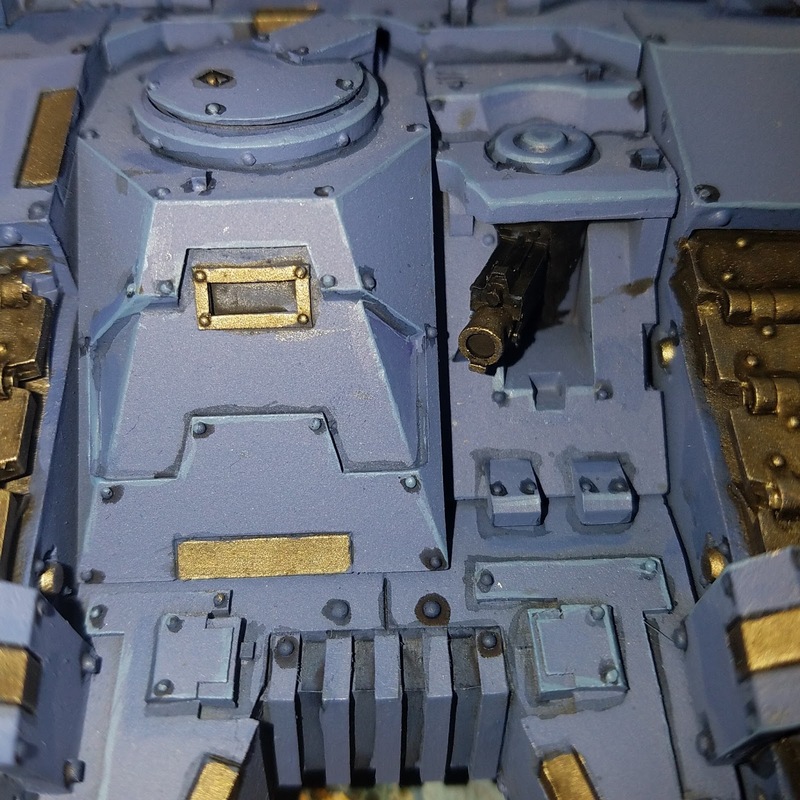 But you can also see that the armor plates and sections are pretty clearly defined now. 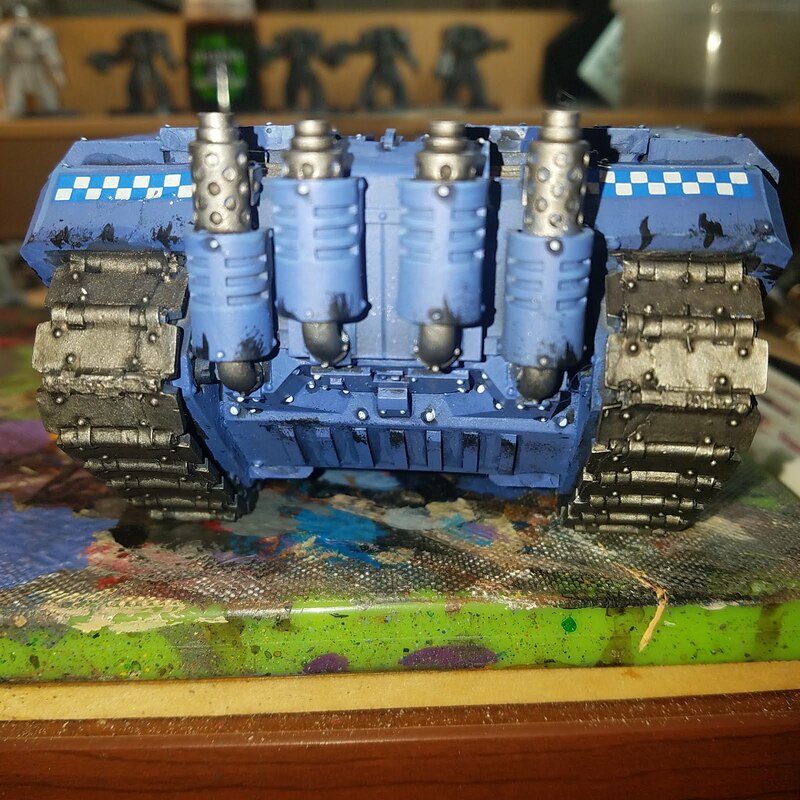 Yes, I know, you can pre-shade with an airbrush. However, since my main color is a surface primer, and that is made to COVER everything, it doesn't work so well. Once the pin-washing is all done, go back and trim up, and keep on painting. Although it is rather hard to see on the turret, there is some pin-washing on here, especially around the copula. Okay folks - ENJOY, and get those brushes dirty! Next round, applying decals, and maybe my own tips for battle scarring and weathering. Because we all need dirtied up Space Smurfs. Until next time!